Square, now Square-Enix, is most known for their RPG series Final Fantasy, as well as some other RPGs of note such as Secret of Mana, Chrono Trigger, and Super Mario RPG. 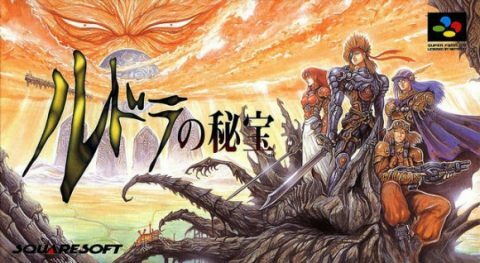 Treasure of the Rudras, or Rudra no Hihou is one of the many countless Japan-only RPGs that didn’t make it stateside. 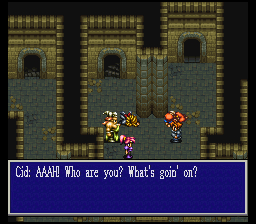 Some of the more common Japan-only titles that have fan translations are Seiken Densetsu 3, Bahamut Lagoon, and Live A Live, but Treasure of the Rudras flew right under the radar, and has remained an obscure RPG. 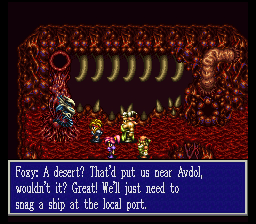 A late fan translation also didn’t help in the spread of Treasure of the Rudras. While many of the other Japan-only titles were translated in the mid to late ’90s, this game didn’t get a basic fan translation until 2003, and a final translation until 2006. 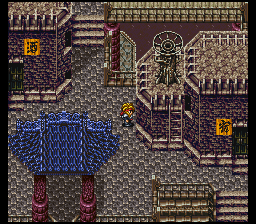 Treasure of the Rudras was released in 1996, which was very late in the lifespan of the Super Famicom/Super Nintendo. Because the next generation of consoles was already taking over by that time, Square decided that localization would not be worth the time and effort, so Treasure of the Rudras didn’t see a release outside of Japan. If they were to pursue a stateside release, it would have coincided right around the same time as the release of Final Fantasy VII for the 32-bit Sony PlayStation, so they would have not only been competing with themselves in terms of marketing and sales, but there would have been a rather large price gap between an expensive 16-bit cartridge versus 3 CD-ROMs. If you walked into a Babbage’s in 1997 would you have opted for the $69.99 cartridge game or the $49.99 3 disc multi-million dollar budget title from the same developer? Not a hard choice there. Treasure of the Rudras was designed by Square veteran Akitoshi Kawazu, who has worked on early Final Fantasy titles, the SaGa series, and more recently, the Crystal Chronicles series and the “we won’t call it a Final Fantasy even though it pretty much is” The Last Remnant. Those familiar with the music in Final Fantasy: Mystic Quest may notice a similar compositional style, and that’s because Ryuji Sasai worked his magic on the soundtrack for Treasure of the Rudras, clocking in at a whopping 58 tracks. The plot focuses on the 15 days before the extermination of the human race – as many other races have already begun to disappear. 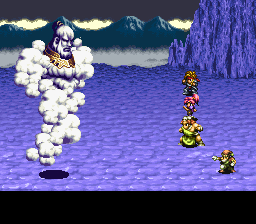 The story unfolds from the view of three different scenarios – it’s like the assault on Kefka’s Tower except not nearly as tedious because Gau and Umaro are punishingly under leveled. 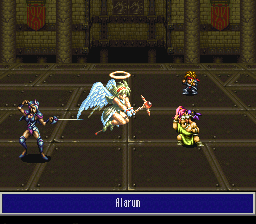 Anyone who’s familiar with Square knows that they’ve always liked to incorporate elements from various religions – the religious symbolisms and spell names in Final Fantasy VI, references like the Tower of Babel in Final Fantasy IV (though it’s called the “Tower of Babil” in-game), so it should be no surprise that in Treasure of the Rudras, they chose to focus on various aspects of Indian religions. The most predominant religious themes within Treasure of the Rudras are the concepts of “the wheel of time” – whereas every 4000 years the world is destroyed and recreated by a Rudra, and the name “Rudra” itself is a reference to Indian theology, which became a synonym for the god “Shiva” – the Hindu god of destruction, and for whatever reason ice spells in Final Fantasy games. 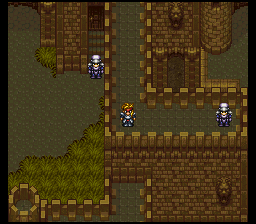 The plot centers around three major characters: Sion the soldier, the priestess Riza, and the archaeologist Surlent. While their stories are separate, the characters may run into each other in their respective storylines, and at the end, eventually converge into one party for the final chapter of the game. As the player progresses in each storyline, time from the 15 days before their imminent destruction starts to tick away, and actions taken in each storyline can affect how the others’ pan out. Another interesting element that Square added was that each character’s story can be played in any order, and the player may even leave one storyline to play another for a while, so the game is pretty flexible in how one would play. 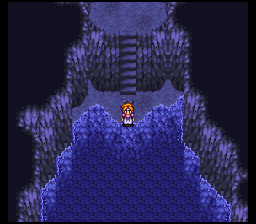 While the core gameplay doesn’t stray far from the standard JRPG format that Square themselves pioneered, the one aspect that stands out from the many other RPGs of its time is the magic system – called “Mantras.” In most games, characters acquire magic spells either from leveling up, items, or stores, but in Treasure of the Rudras, magic is written in a grimoire – a spell book essentially. Players craft their own Mantras by writing them into the grimoire, and each spell is constructed with an elemental core, to which prefixes and suffixes are added to modify its effect. The cores determine the element that is tied to the spell, while prefixes and suffixes can change targets, status effects, and base attributes, such as cost and base power. 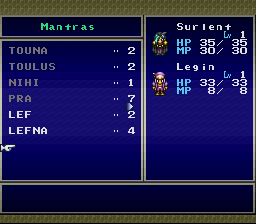 Throughout the game, various NPCs will inform the player about Mantra parts. For example, a bartender may tell the player how to create healing spells, or a member of the townsfolk may inform the player of a suffix to cast on multiple targets. 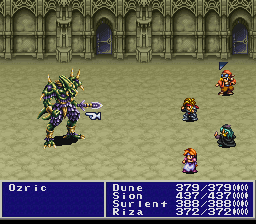 The player can also learn mantras from enemies – when an enemy uses a mantra, the player would simply have to write down the spell and enter it into their grimoire after the battle – a very interesting and innovative idea for a genre that is filled with so many formulaic titles and battle systems. This was also one of the main reasons that the fan translation was so difficult and took so long, as a Japanese kanji character takes up only one character slot, whereas the Romanization of that kanji could take up two or more. 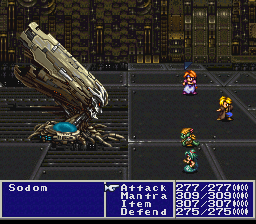 The mantra system isn’t entirely random in its selection of elements – the elements and abilities within refer directly to the game world, so it’s not like in Final Fantasy VII, where the characters run around somehow summoning ancient deities in a world of technology and advanced science. Theoretically, a player could use an FAQ to create powerful spells early on in the game, giving them an advantage by manipulating the game with pre-existing knowledge. The one way the game does limit this is that the grimoire can only hold a specific number of inscribed spells – so sometimes in order to create a spell, the player may need to forget a spell. The more effective the spell, the more MP it costs, so having very high powered spells early on isn’t advantageous, as it requires more MP than most characters would have. One thing to note is that there are some special mantras that don’t follow the normal mantra scheme, most of which are English – for example, the mantra “Phoenix” is a 16 MP spell that grants auto resurrection at 25% HP, a reference to the well-known “Phoenix Downs” from the Final Fantasy games. The graphics are gorgeous. Since it was so late in the Super Famicom’s lifespan, Square was well aware of the console’s limitations, as well as how to get around them. 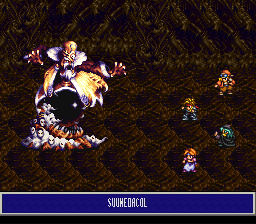 The sprites are very detailed and well animated – very reminiscent of a cross between the detailed terrain of Final Fantasy VI with the color palettes and character styling in the vein of Bahamut Lagoon, although not quite as large, with the exception of in battle enemies. 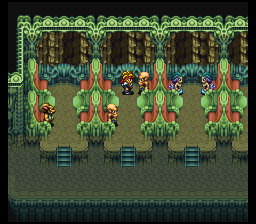 Like Seiken Densetsu III, the game uses the SNES’ high resolution mode, though it’s only to output nicer looking text. The animation is superb – both in battle and out of battle. The enemy and boss animations are some of the cleanest on the console, and add an entirely new level of immersion not found in other JRPGs from the 16 bit era. 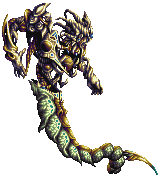 Many boss enemies have animated limbs and appendages, as well as immense size, which adds drama and a sense of urgency to the combat (think Chaos from the original Final Fantasy, but way more common.) One aspect of the graphics that could be considered a drawback is that since themes of the story and world center around the idea of pollution, sometimes the colors may seem dark and muddled. For some this may cause issues with discerning walkable terrain and background terrain, not to mention dreary backdrops/parallax backgrounds that don’t provide much contrast with the foreground imagery. Overall, the game plays fluidly, and the mantra system brings something new to the table that anyone who appreciates JRPGs would be able to enjoy. The graphics are gorgeous and extremely well animated, and add a great sense of scale and detail that one would be hard-pressed to find in another title of the 16 bit era. The soundtrack is solid, although not as memorable as some of Square’s other games, but this is to be expected due to its late release and narrow regional distribution. The storyline isn’t anything too spectacular – it follows your standard “heroes journey” model with minimal plot twists, but the gameplay mechanics more than make up for the lack of originality story wise. In short, it is a lot like Kawazu’s SaGa games – it’s light on story, with a strange (but cool) magic system, and a relatively high level of difficulty. American gamers will only be able to experience Treasure of the Rudras either through emulation or by purchasing a reproduction cart, but all serious RPG players owe it to themselves to experience this ground-breaking, and sadly secluded title. Let’s Play – Rudra no Hihou Some of the screens were taken from this piece. Aeon Genesis – Treasure of the Rudras Website of the fan translation. Sion is the archetypal solider. He lives with his brother Dough in the town of Vad, and longs to be the strongest fighter in the land. He participates in the Tower of the Valiant competition to test his mettle, and tries to outmatch his mentor Taurus, who's the strongest warrior of Cryunne. Standard fighter class, low magic, heavy armor, lots of swords. Riza was born with "The Holy Jade" in her forehead, and is the granddaughter to the monk Zeku, who is the founder of the town of Karn. Her goal is to fulfill the prophecies of the Danans - who state that the holder of the Holy Jade is the purifier of the Earth. Think white mage for Riza (*cough cough* Rosa from FFIV) canes and bows, strong spell caster. Surlent is a disciple of the prophet Solon who spends his days as a hermit in a cavern on the Thor Volcano. Solon predicts that the end of the world is coming and that the link can be found in the secret of the Lago Stones. Since Surlent is an archaeologist, he's sent to investigate, and starts off by working with Dr. Meunch who researches the stones. He eventually becomes the proud owner of the Revival Jade. Mitra is the great creator of the Earth and the moon. Mitra created Sodom to eliminate the old races (as what happens throughout the game), and the party comes to the conclusion that Mitra must be defeated in order to prevent another Sodom from being built, and thus prevent the further elimination of races.